A hernia occurs when a body organ finds a weakness in the fascia (muscle and connective tissue) that surrounds it and pushes through it forming an opening and a bulge. Increased pressure in the abdomen can result in a hernia including heavy lifting, pressure from diarrhea or constipation or even consistent coughing or sneezing. Other factors that can contribute to a hernia include obesity, poor nutrition and smoking. Hernias occur most commonly in the abdomen and groin but can also occur in the upper thigh, the navel or where there is pre-existing scar tissue. Hernia surgery is used to repair the affected area and correct the hernia and is one of the most common types of surgery performed worldwide. Although hernias are not usually life-threatening, they can cause pain and don’t go away. Different factors determine when you will need hernia surgery. Depending upon your pain level and/or the size and location of a hernia, surgery may be required to prevent possible complications. Inguinal hernia. These are located in the inner groin and occur when the intestine or bladder pushes through the abdominal wall into the inguinal canal. The majority of groin hernias are inguinal and they are most common in men. Incisional hernia. This is when there has been previous abdominal surgery and the intestines push through the incision scar. This is more common in overweight or elderly patients. Femoral hernia. This when the intestine protrudes not the canal that carries the femoral artery into the upper thigh. This type of hernia is most common in women particularly affecting those who are pregnant or obese. Umbilical hernia. This is when part of the small intestine protrudes the abdominal wall near the navel. This type of hernia is most common in newborn babies as well as women who have had a larger number of children or are obese. Hiatal hernia. This is when the stomach is squeezed through an opening in the diaphragm. Strangulated hernia. This is a dangerous complication and will require immediate emergency treatment. Where is it done? 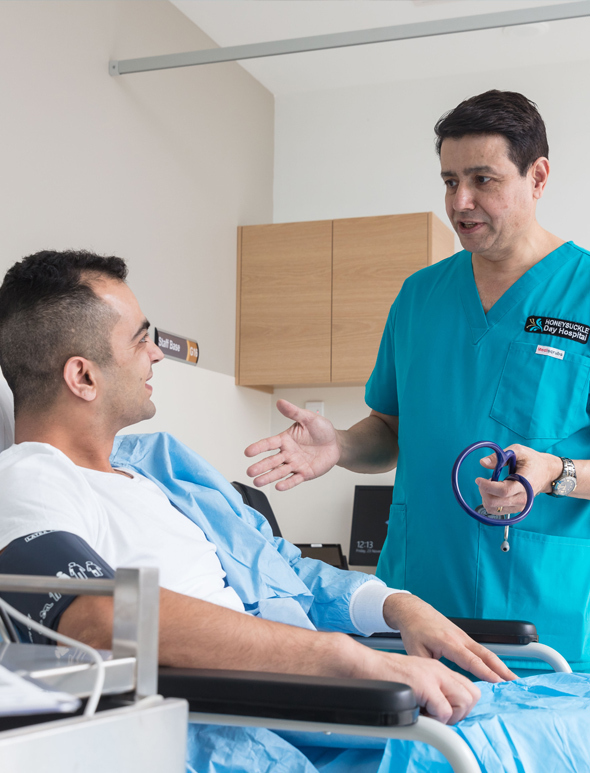 : Your hernia will be performed at the brand-new Honeysuckle Day Hospital in Newcastle, a fully licensed and accredited day hospital which specializes in cosmetic surgery. Length of surgery: Usually between 60- 90 minutes. Do I qualify for hernia surgery? If you have a large hernia or a hernia that may cause other complications, you may be eligible for hernia surgery. Who is a good candidate for hernia surgery? 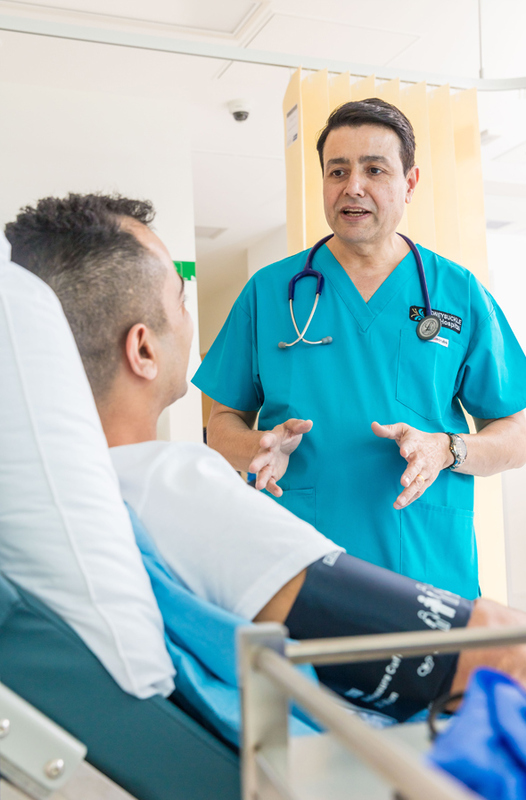 Patients who have a hernia that is large, growing in size, causing pain and/or causing other internal structures to become trapped can be good candidates for hernia repair. Dr. Verma will thoroughly review and discuss your medical history as well as any images that have been undertaken to diagnose your hernia. From this, he will be able to assess the hernia and the suitability/necessity of surgical repair or if a “watch and wait” strategy can be adopted and will discuss this with you in detail. He may also take photos of the hernia site in order for pre and post-operative documentation. The location and size of the incisions and scars will be dependent upon the type and location of the hernia. Wherever possible, Dr. Verma will use a minimally invasive technique which will minimise the size of scars. He will discuss this with you at your consultation. What are the risks and complications of hernia surgery? 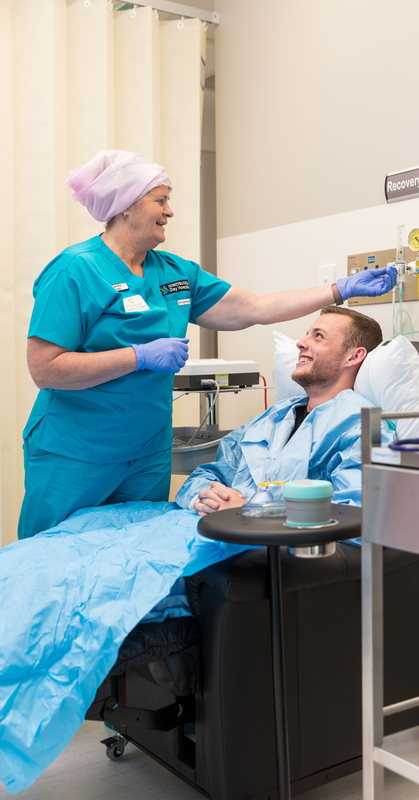 General risks of any surgery include excessive bleeding, reaction to any of the medications (including anaesthesia), infection, poor healing or excessive scarring, clotting in the legs. What are the side effects of hernia surgery? Formation of a seroma/hematoma (pockets of fluid). This is a common complication that occurs after hernia surgery. In most instances, patients who are sedentary workers are able to return to work after 1- 2 weeks of downtime however if your occupation involves manual labor and/or lifting you may need a longer recovery period. Lifestyle modifications post surgery will include limiting strenuous exercise and activities for approximately 4 – 6 weeks after surgery. You will be encouraged to undertake gentle exercise such as walking post surgery as this can assist with the healing process. Your incision area will be sore and painful for several days after surgery and results will be visible after your tissues heal, when swelling and bruising subside while full results to become visible may take up to a month. 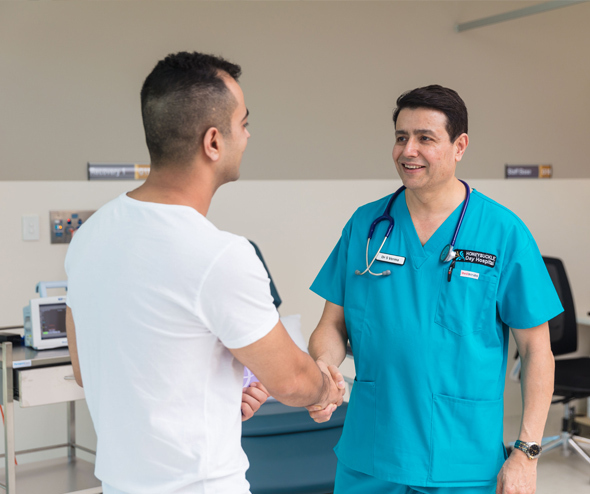 Similar to your consultation visit (see above), Dr. Verma will be taking photographs of your hernia repair site in order to document its healing during follow up visits. How long do the effects of hernia surgery last for? Hernia repair surgery can provide lifelong results, however some hernias can recur and may need corrective revision surgery. Dr Verma will discuss this with you at your consultation.